Whether you’re walking to class, driving to class, commuting to an internship or still laying in bed, everyone needs a little bit of morning entertainment. Music is usually what’s streaming through everyone’s earbuds as they walk through campus. However, it can be good to switch up your morning routine every once and awhile. Turn off the tunes and turn on a podcast for a little brain food to start off your day. Here at A, we love to add in a bit of inspiration and motivation on our morning commute. We love podcasts because they can be funny, educational, and motivational and you can listen to them almost anywhere. It can be overwhelming to find the perfect podcast when there are over 250,000 podcasts on iTunes alone. That’s why we chose some of our favorites for you to start with. So open up your iTunes app, or wherever you listen to your podcasts, download some of these and put some motivation in your morning. 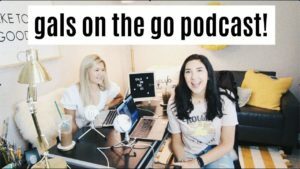 Influencers Brooke Miccio and Danielle Carolan recently started their Gals on the Go podcast. Brooke and Danielle are two busy gals as they both attend the University of Georgia, are members of a sorority, have their own merchandise, and host their own youtube channels. Talk about a gal on the go. Their show is a mix of interviews, productivity tips, and travel stories. Their dynamic is energetic and lighthearted but they know how to get serious too. As college students themselves, they’re relatable, they get it. If Brooke and Danielle sound like your kind of gals you can download their newest episodes weekly on Wednesday. Favorite episode: How to De-Stress, Study Tips, and Time Management. This is the perfect back to school episode. It’s packed full of tips on time management for your busy life. Got that first exam coming up? Don’t stress this episode also has some effective study habits and ways to de-stress so that you can ace that exam. Tune into Jaci Marie Smith and Chelsey Jade Curtis for inspiration and entertainment. Topics you can expect to hear them chatting about range from health to business. These girls are the sweetest and give the most heartfelt advice. It kind of feels like you’re listening to some of your closest friends. We like to listen to them on gloomy mornings when we need an extra boost of positivity to brighten up the day. Jaci takes over for this episode to share her knowledge on all things social media. She lets you in on the glamorous and not so glamorous aspects of her career as a social media influencer/creator. With so many people working from home or independently these days, it’s easy to cross the line from personal life into work life. Jaci talks about how important it is to create a balance between work and life to avoid every freelancer’s fear – burnout. Youtube’s favorite fitness couple Sarah’s Day (known as Sezzy) and Kurt Tilse have started their very own podcast. Sezzy and Kurt are laugh out loud hilarious. They have a holistic approach to health that is real and unfiltered. Kurt is a personal trainer so be prepared for some serious workout tips. Not only will you learn more about health from them, but you’ll also hear stories about their puppy Miss Abby Day and their experiences moving to a new apartment building in the weekly wrap up section of the podcast. Download any of their episodes for when you need some fitspo and you won’t be able to stop listening. This episode is a favorite because it’s hilarious and helpful. Sezzy and Kurt dish out their best healthy hacks and tips pertaining to fitness, health, and lifestyle. I love it because all of their tips are simple to integrate into your everyday life. On the dating side of the episode, who wouldn’t want to hear a guy’s perspective on today’s dating world? The fashion industry moves so fast that sometimes it’s hard to keep up on the latest and greatest. Glossy is your new go-to for everything fashion news. Tune in weekly to learn about the newest technology in fashion. This podcast interviews some BIG names in fashion from the likes of Rebecca Minkoff to Rebecca Taylor and everyone in between. Staying up to date on the current fashion news keeps you relevant within the industry. Glossy is the easiest and most effective way to keep up. Favorite episode: Eileen Fisher on 34 years in sustainable fashion: ‘“It’s about constantly learning,” says Fisher. Eileen Fisher is one of the biggest names in the hottest trending topic in the fashion industry – sustainability. This episode shares Eileen’s story firsthand and her perspective on the ever-changing world of sustainability. 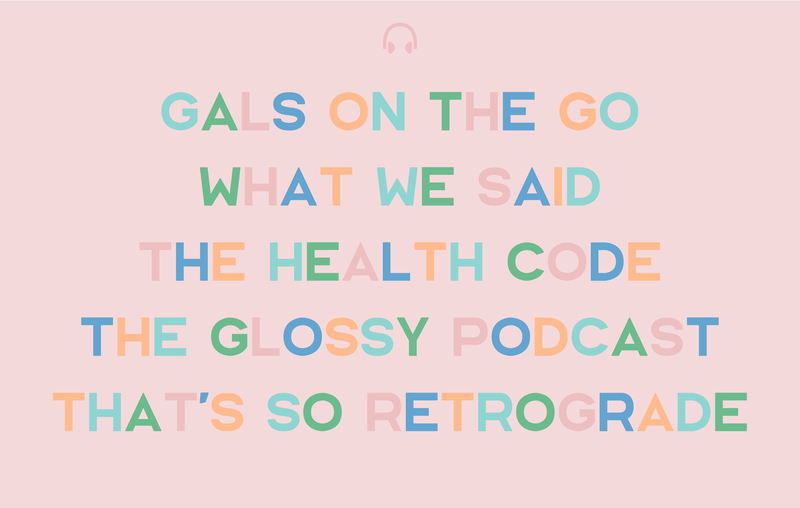 Listen in for a dose of pop culture and “wellness” as Elizabeth and Stephanie like to call it. Their podcast is all about seeking out your most authentic self. In a world where social media is more and more prevalent, they remind you that the best way to set yourself apart is by being yourself. Realness and humor, conscious conversations. They bring on all kinds of guests from comedians to shamans and gurus. 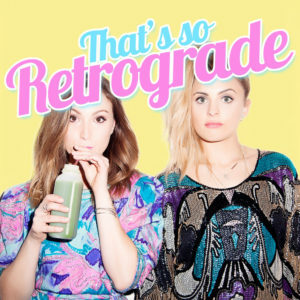 If you’re looking for a dose of reality without the sugar coating delivered with laughs and relatable moments, That’s So Retrograde might just become your newest obsession. If Elizabeth and Stephanie weren’t enough for you they added guest Lauren Handel Zander, founder of the Handel Group and author of Maybe It’s You, to this episode. Lauren is a life coach who has plenty of advice to share on her coaching method and how to live your best life. The ladies go deep on all topics in this episode making it the perfect place to start.